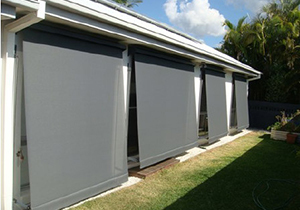 The Automatic Roll up awning will protect your home and cut down your cooling expenses with Australian-made Automatic Roll-up Fabric Awnings. Easy function, self-locking arms allow for flexible height settings with easy adjustment by hand or by pull stick. The optional colour coordinated headbox provides complete protection for your Automatic Roll-up Fabric Awning when retracted. The fully enclosed side channel retention system awning is a versatile straight drop option ideal for sun UV protection, insect resistance, windy applications enclosing a balcony plus creating privacy, light and heat control. The fabric is tensioned by utilising a floating channel located within the special two piece side channel eliminating the possibility of fabric blow outs or light gaps as the fabric is held taunt between the left and right channels. 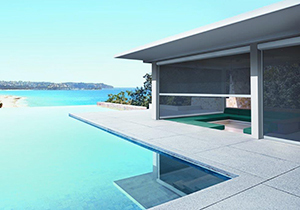 This system is ideal for enclosing courtyards, patios or balconies, essentially adding an extra room to the home. An optional fully enclosed headbox which will protect the fabric when not in use. 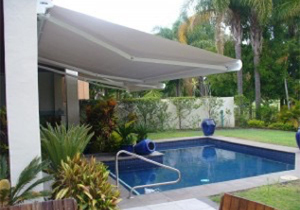 Folding arm awnings are ideal for shading BBQ areas, pools and decks. The awning can be motorised or manually operated using the spring loaded gear box mechanism. The arm joints are reinforced by a unique triple interlocking stainless steel chain. 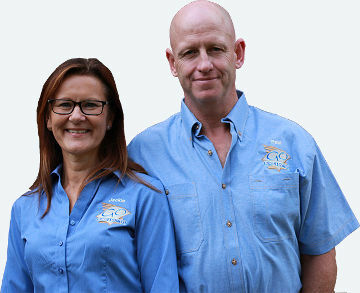 This not only adds strength to the awning but also allows fabric tension to be maintained. The Pivot Arm Awning is ideally suited to second floor windows where the operation for the awning can be driven from inside your home. A neat hole is drilled through the wall, where heavy duty tape is inserted. A UV treated swivel roller is fixed to your wall and a tape box or winch is fixed to the inside of your wall for easy operation. A weather box can be included which will protect the fabric when not in use. The weather box can have a powder coated finish in a colour of your choice. 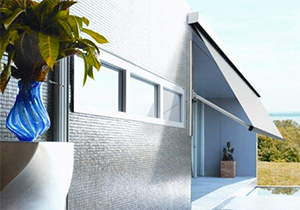 The straight drop wire guide awning is made using stainless steel cables. The cables run vertically and are bolted into place which prevents the blind from moving in the wind. Stainless steel tensioners are used to insure the cables are tight. 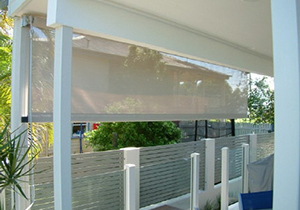 The awning can be made using a variety of fabrics including sunscreen and block out materials. A crank handle is used to operate the awning.